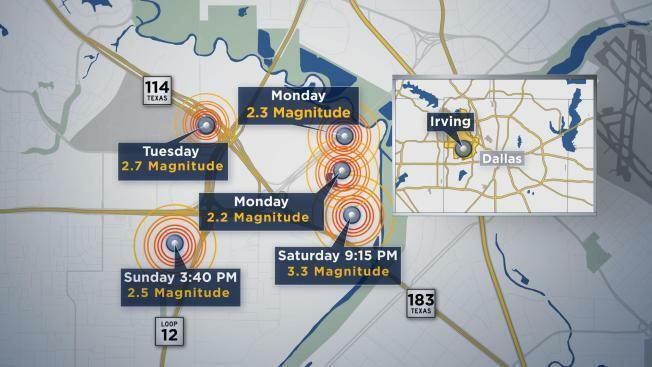 An earthquake Tuesday afternoon brings the number to five earthquakes centered in Irving in four days. The first earthquake, Saturday night, was a magnitude 3.3 quake. It happened at 9:15 p.m. just northeast of the old Texas Stadium site and was felt by hundreds of North Texans. The NBCDFW Facebook Fan page received more than 1,300 comments about it. The U.S. Geological Survey confirmed a magnitude 2.5 earthquake shook Irving at 3:40 p.m. Sunday afternoon. The second quake's epicenter was along Loop 12, just south of where it intersects with Texas 183. A third earthquake measuring 2.3 rattled residents Monday at 7:06 a.m. The quake was centered along Spur 482, northeast of Texas 114, near Dr Pepper Snapple's headquarters. Four earthquakes centered in Irving have shaken parts of North Texas since late Saturday. The fourth earthquake hit Monday at about 11:45 p.m. It was a 2.2 tremor near Spur 482 and Century Center Boulevard. A fifth earthquake was reported at 4:39 p.m. Tuesday. The USGS reported the 2.7 magnitude quake was centered on State Highway 114 and N Walton Walker Boulevard just east of the University of Dallas campus. NBC 5 viewers called the station, wrote in and posted reports of feeling the quake on social media. The five earthquakes follow two others in Irving earlier this month.